Discussion in 'Tutorials & Examples' started by Erel, Apr 11, 2019. All the logic is implemented in a class named EditableTable. The module is located in the projects parent folder. The two asset files (list of animals - source; and the preferences dialog template) are stored in the Shared Files folder and are copied when needed with a #CustomBuildAction command. You can see it in the EditableTable class. Note that if you want to update those files then you need to update the files in the Shared Files folder. The project specific files will be updated automatically. Data is saved when the app closes to a CSV file. Saved data is loaded when the app starts. The B4A, B4i and B4J projects are attached. mendiburen, swamisantosh, Johan Hormaza and 13 others like this. Can data be saved in SQL database? Save it anywhere you want, I believe. 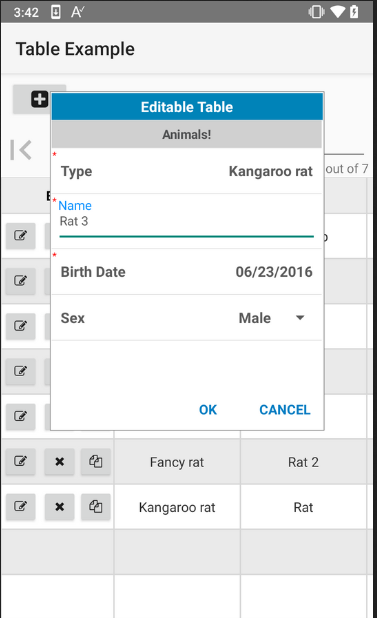 Add SQLite to your app, create the database, and save and read the data. Add jRDC2 to read and save the data on a server. Both SQLite and jRDC2 are searchable items on the forum. That's true. It is simple to save the data with any data store you like. This includes: CSV, SQL db, JSON, KVS2 and any other store you can think of. See the list of dependencies in the first post. How can i create another query window ? Please start a new thread for any question you have.